A Quiet Place is not strictly speaking a 'silent' film. However, I don't think silence and sound have been as well-used in a film as well as A Quiet Place does in a long time. Keeping within the traditions of a horror and science-fiction film, A Quiet Place draws from the past to create something original: a logical film that brings its frights less through gore than through genuine tension. We start at Day 89 of a worldwide disaster and quickly find that aliens have invaded Earth, hunting down beings through sound. The Abbott family has managed to survive, in part because of their daughter Regan (Millicent Simmonds), who is deaf. As such, they can communicate via American Sign Language. Tragically, Regan's younger brother Beau (Cade Woodward) has become fascinated with a toy space shuttle. Their father Lee (director/cowriter John Krasinski) denies him the toy while the family scavenges for supplies, signing that it is too loud. Regan, however, quietly gives it to him, along with the batteries. As the family comes close to crossing the bridge back to their isolated farmhouse, Beau turns the toy on, and despite Lee's frantic rush to rescue his son the aliens manage to grab and kill Beau. It is now Day 472. Lee continues to try and make contact with anyone via Morse code, and the family prepares for a new arrival. Lee's wife Evelyn (Krasinski's real-life wife, Emily Blunt) is pregnant. Lee, Evelyn, Regan and their surviving son Marcus (Noah Jupe) have been preparing a quiet room where she can deliver the child. Regan carries both guilt and anger, constantly frustrated by Lee's failed efforts to create a working implant. Now on the critical Day 473 everything happens. Regan seems to run away at the worst time. She wanted to go with Lee to learn to hunt and fish, but he'd rather take the more reluctant Marcus, urging Regan to stay with her mother. Evelyn not only goes into labor while Lee and Marcus are off to train for when Lee may not be around but injures herself on an exposed nail. The aliens are coming closer to their homestead, and it becomes a race to save Evelyn and all the children, including the newborn. Not everyone survives this dark night, but the high-pitch sound Regan's new implant emits has a negative effect on the aliens. With this discovery, Evelyn is now able to finally fight back. 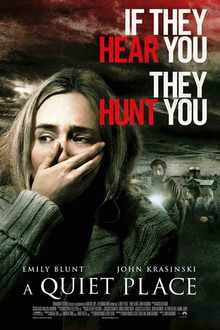 A Quiet Place, intentionally or not, draws inspiration or at least comparison to such dystopian stories as The Omega Man in the tale of survivors in a hostile world. One of its best moves is in how it handles sound, or the absence of it. With the lack of sound or voices, the 'jump scares' come from when that silence is broken. We become so immersed in this silent world that when that silence is shattered, we get surprised. The film is especially good at capturing Regan's total silence, particularly in the beginning where she cannot hear the toy. The total silence juxtaposed to the alarming sound, along with Blunt's inability to scream out either in terror or Krasinski's inability to shout out a warning increases the tension. Krasinski as a director also allows sound to enhance the story. There is a tender moment in Day 472 when Evelyn puts her iPod headphones to Lee's ear, and Neil Young's Harvest Moon breaks the stillness. This counteracts the potential for fear and makes the scene more tender, romantic and moving. Few films have used sound and silence and Harvest Moon to such beautiful use, telling us the deep love between Lee and Evelyn without having to use words or even sound. Interestingly, it is not until 36 minutes until we hear actual dialogue spoken, everything communicated by either American Sign Language or facial/body expressions. A Quiet Place has a logical reason for this (louder noises such as the waterfall mask their voices). This allows for some break in the tension and a chance to allow the actors to use their voices. Krasinski as a director has made a fine film, well-crafted where the visuals and sound (or lack thereof) works to build up the tension. There are some scenes that are visually arresting, such as when the quiet room starts to flood. The image of the crib floating in the water is almost Biblical, an intentional/unintentional call-back to Moses floating down the Nile. I doubt such thoughts were in the minds of Krasinski or his cowriters Bryan Woods and Scott Beck, but I got that from them. He also draws exceptional performances from his small cast (there are only six credited castmembers, all but one a member of the Abbott family, and all the non-Abbott member did was scream to commit suicide-by-alien). Blunt is brilliant as Evelyn, who has to communicate so much with just her face (I think she has maybe one scene with actual dialogue if memory serves correct). Krasinski too holds his own as the paterfamilias, the constant look of worry hanging over him as an intense burden. His signing of love to Regan and Marcus is a beautiful and heartbreaking moment. It's a credit to Krasinski as director that he got such strong performances out of his young cast. Simmonds is strong as Regan, the mixture of frustration, regret and fear never failing to elicit a response. Same for Jupe, whose fears are natural in this supernatural world but who has a strong moment with Krasinski, urging his father to tell Regan he loves her and does not blame her for Beau's death. If there are flaws in A Quiet Place, it is in the overt foreshadowing we get, such as when we see the nail emerge on the staircase. I also did not understand why Lee and Evelyn were so resistant to letting Regan into the basement where Lee had his informal lab. His refusal to let her help him forage for food is slightly more logical but strange given Marcus' reluctance to Regan's eagerness. Finally, the resolution to the alien crisis, while not just 'suddenly discovered', seems slightly convenient. These are small quibbles in a finely-crafted film that gives us frights and heart. A Quiet Place is more than just an alien invasion story. It's a story about family, about parents who would do everything to protect their children, down to sacrificing themselves. The mixture of intelligence and heart elevates A Quiet Place to being one of the best films of the year, one that both fits into and transcends the horror/sci-fi genre.